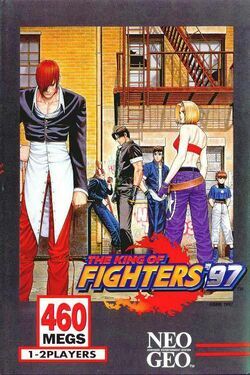 King of Fighters '97 is the fourth game in the King of Fighters series. This King of Fighters has the introduction of two special modes: Advance Mode (based on KOF '96) and Extra Mode (based on KOF '94 & '95). It concludes the three part 'Orochi Saga' story-line begun King of Fighters '95 (and continued in KOF '96). Despite the events at the end of The King of Fighters '96 the 1996 tournament was a huge commercial success and sparked a world-wide fighting craze within a few months of the tournament ending, various large corporations held smaller tournaments and constructed special King Of Fighters stadiums around the world building the excitement up for the 1997 tournament. News of the tournaments spread through every form of media and fans and new fighters from across the globe came to watch the preliminary matches. Geese Howard has entered as the new '97 Special Team' of Ryuji Yamazaki, Blue Mary and Billy Kane with intentions of harnessing Orochi's power. There is also a mysterious New Faces Team, composed of three band-members Shermie, Yashiro Nanakase and Chris which enters with the terrible intentions of raising Orochi again. This page was last edited on 11 December 2010, at 21:33.